Communism might be a soul-crushing ideology written on a bar napkin, but it’s given us some really good games. Command and Conquer: Red Alert bestowed us with a Soviet Union from a B-movie perspective, Papers, Please gave us a good look at its bureaucracy, so it’s high time we got something with a greater tongue-to-cheek ratio. Set in a bizarre Eastern European country ruled by t̶y̶r̶a̶n̶i̶c̶a̶l BELOVED leader, the game will take players through an exciting and often exaggerated spy story of epic communist vs capitalist caricatures. 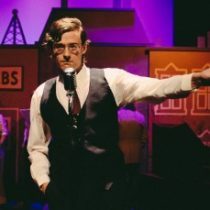 Take on the role of Evan, a bumbling journalist and unbeknown spy as he solves puzzles, meets the eccentric people of this great nation and reveals what’s actually behind the Irony Curtain. Irony Curtain also boasts ‘1,951 easter eggs’, hand-painted locations, and ‘an alternate reality unbound by historical accuracy’. The game will draw heavily from Communist propaganda cliches, a subject matter that Poland is more than familiar with; the country became a Soviet satellite state – albeit a relatively liberal one – after its ‘liberation’ from Nazi Germany in the Second World War. Poland became the first Warsaw Pact country to break free of Communism in 1989. Irony Curtain launches in the coming months: Q2 2019.